Quilting Adventures: MQX the fun continues...! Friday I took a classes all day! What a day! I tell you I was exhausted by the end of my third class. The first class was with Linda V. Taylor and Cheri Meineke-Johnson. They brought with them the quilt "don't worry, be happy" . What a magnificent quilt! The class was called From Start to Finish. What a hoot Cheri is. She is hilarious! She demonstrated her hand applique techniques. She has quite a repertoire of tools that she uses to assist her in her creative process and not all come from the quilting world. She likes shopping at a hardware store for quilting gadgets and enjoys rummaging through her DH's tool box. Did you know that she loves monkeys? She actually has a pet monkey! Afterwards, Linda took over the lecture and demonstrated on the longarm her creative process for machine quilting. They used a smaller wall size version of the "Don't worry, be Happy" quilt. Linda makes it look so easy! After the class they raffled the sampler. It's up to the winner to finish it off! 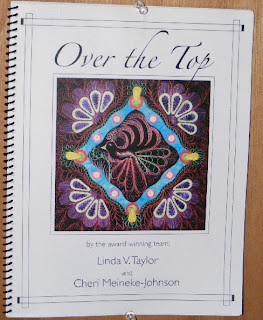 I was not the lucky recipient of the unfinished quilt but I did win this book by both Cheri and Linda. Works for me! They were both quite generous with their prizes. There were a few Crystal sets and lots of other goodies. It made it exciting, waiting to see if your ticket won! My next class was Is there Life after Stippling?, which I took with my friend Jennifer. We had a blast. Linda worked on a project that was designed for a class on the website The Quilting School. She demonstrate how she goes about deciding what to machine quilt. I tell you she makes it look so easy. Again, the sample was raffled and won by a lucky student. Jennifer won the DVD of the Artistic Freedom class. Lucky for me she has offered to let me borrow it. My last class with Linda was called In the beginning. It was a basic class on longarm, how to set up a quilt etc.... It was quite informative. When I was trained at the Gammil dealer (Cowles) the individual had told me that I had to measure from center onward and both sided had to be even. You can just imagine how much time that can take to get it perfect. Add the $15.00 an hour to that and you're stressing to get it just right. Well, Linda doesn't do that. You square up your backing and batting, baste and add your top working in the "off" areas to make it square. I just learned so much! I won this template/ruler in this lecture. I tell you the generosity was unbelievable. The repertoire of prizes/gifts were phenomenal. Thank you so much for stopping by. Your comments mean a lot to me. That sounds like such a fabulous class. It really sounds like the instructors gave you a lot of necessary information for using the longarms. I would love to hear how you decide which machine will be best for you - classes, dealer locations, user friendly or just what. The prizes sound great too. It must have been a wonderful class. Enough with making us be patient!!! Spill the beans, which one did you buy?????? Sounds just like my experience at Innovations - about two weeks after I got my longarm. I took as many classes as I could fit into those three days, and came home totally overwhelmed. That was almost 5 years ago and I still have material from those classes that I've not tried yet. So, have you decided on your machine? I have a couple friends with A-1's and they can't say enough wonderful things about them. I really considered that one a lot but there was no dealer anywhere close to me and the closest - in Montana - wouldn't return my calls. Having a good dealer who is there when needed is almost more important that what machine you choose. Thanks for responding, Carole. 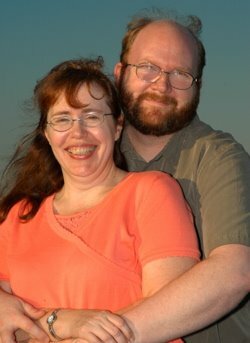 I am new to this blogging world and am not too sure how to do the e-mail stuff yet. I am learning slowly. Sorry. I am going to check the e-mail box at the bottom and see if that works. Sounds like you had a great time at MQX. I really should go next year. Sounds like you had a lot of fun. You are right, it was very generous of the teachers to give away so many items. Hope you've gotten some rest since then. One of these days I will get to MQX or MQS. Sounds like lots of information and FUN! Last year at Chicago and Paducah I tried all the machines and had a hard time deciding. What a great time you had, and wow what wonderful giveaways! You are learning so much.